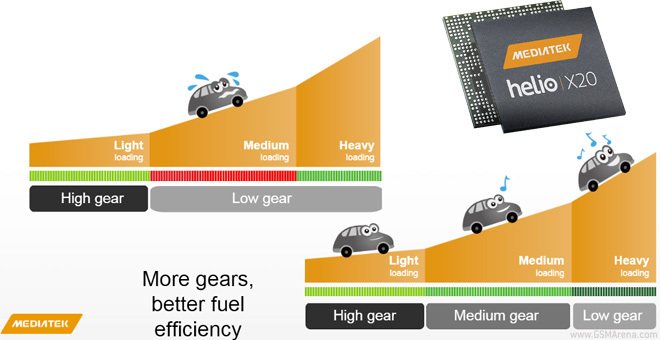 MediaTek likens it to driving a car uphill – conventional big.LITTLE has two gears, while Helio X20′s tri-cluster design has three, so it can more closely match the demands of the software. The first cluster contains four Cortex-A53 cores clocked at 1.4GHz, the medium gear is another quartet of A53s but clocked at 2GHz and finally two Cortex-A72 cores at 2.5GHz for the steepest hills. All ten cores are 64-bit enabled. The chipset has a strategy for balance the ten processor cores, but also the Mali-T800 GPU. It’s called CorePilot 3.0 and it distributes the load between the CPU and the GPU. MediaTek claims a 39% power saving in playing HD YouTube videos and 41% when on a Skype call. Heavier loads allow for less savings, for example loading Temple Run cuts the savings to 17% while loading a web page nearly wipes them completely (down to 5%).